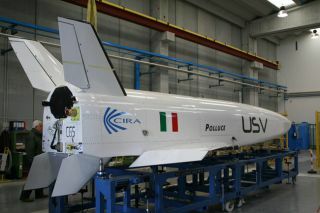 The Italian Center for Aerospace Research (CIRA) is poised to fly its Pollux vehicle, an unmanned space plane prototype, in a drop test aimed at testing in-flight maneuvering capabilities. Hypersonic space planes may someday fly into space fromairport runways, but an Italian aerospace firm first wants to test whether suchfuturistic vehicles could still pull off high-speed maneuvers during the fieryre-entry into Earth's atmosphere. The Italian Center for Aerospace Research (CIRA) inCapua, Italy has prepped a new unmanned prototypespace plane called Pollux for a possible flight in March. Pollux wouldperform several test maneuvers while reaching a top re-entry speed of Mach 1.2. "We want to fly while re-entering, and we want toreduce the logical gap between aeronautics and space," said Gennaro Russo,CIRA's Space Programs lead and USV (Unmanned Space Vehicles) program manager. A less-advanced twin to Pollux, the engineless prototype spacevehicle named Castor, successfully flew at transonic speeds betweenaltitudes of about 10 and 6.2 miles (16 to 10 km), and reached a top speed ofMach 1.08, or just above the speed of sound. Pollux is designed to reach its drop height of about 15miles (24 km) courtesy of a stratospheric balloon. Upon release, the spacevehicle is expected to carry out pre-programmed aeronautic maneuvers where itpulls its nose up, conducts an angle of attack maneuver, a two-bank turnmaneuver, and then finish with another nose-up maneuver before opening itsparachute at a height of just over 3 miles (5 km). All those twists and turns would allow the 500experimental sensors aboard Pollux to record the acceleration, aerodynamicpressures, and strain throughout. That information will go a long way towardhelping researchers figure out what maneuvers a hypersonic vehicle could pulloff as it comes in for landing from space, researchers said. "Being able to handle the flight and not simply thedrop along a re-entry trajectory, you will be able to select the landingspaceport regardless of the weather conditions during the re-entry,"Russo told SPACE.com. Like its twin Castor, Pollux is a 30-foot (9.1-meter)long flying test vehicle with a wingspan of 13 feet (4 meters), and a weight of2,910 pounds (1,319 kg). But Pollux has more advanced control systems thatallow the unmanned space vehicle to autonomously make its own last-minutetweaks for flight patterns. Pollux also has a single-stage parachute, rather than thethree-stage parachute used by Castor in 2007. Castor's three-stage parachutedid not slow it down enough to avoid some damage upon landing two years ago,but Pollux's handlers seem confident that they can better control the newerprototype and slow it down enough to require just the single-stage parachute. Two experiments are also slated to ride piggy-back aboardPollux. The first is a systems-on-a-chip designed by the company StragoRicerche, which will help gauge accelerations for the flight. The second is aphysics experiment by second grade schools of Italy's Apulia region that willsurvey atmospheric opacity due to aerosols. The flights of Castor and Pollux may also help informother ongoing efforts to develop space planes. The British company ReactionEngines Limited received initial funding last year from the European SpaceAgency and British government to begin developing its Skylon space planeconcept. The U.S. Air Force has its own secretivespace plane set for launch later this year. Russo and CIRA have already begun planning beyond theirtwin space vehicle prototypes. A hypersonic version that could reach Mach 7 or8 is on the drawing boards due to collaboration with the University ofQueensland and Australia's Department of Defense.